Quite unlike the beginning of last year where activities were more planned or organized under the banner of Body, Mind and Spirit, it seems this year events just continued with a tapestry of all three rolled into one. Most important was to continue the course of the braces for his teeth that began in KL before all the boys continued their studies in Singapore in 2007 and after at long last it is finished! It was nice of Sis Howell to treat us lunch. 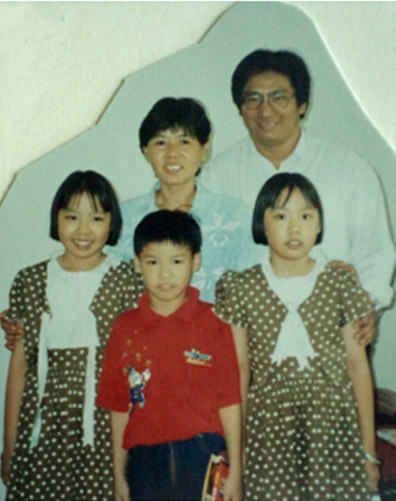 She and her husband were in our Clementi Ward in Singapore previously and were transferred on their mission to KL. We see the other missionaries who were having lunch at the same time as there was a zone meeting on that day. 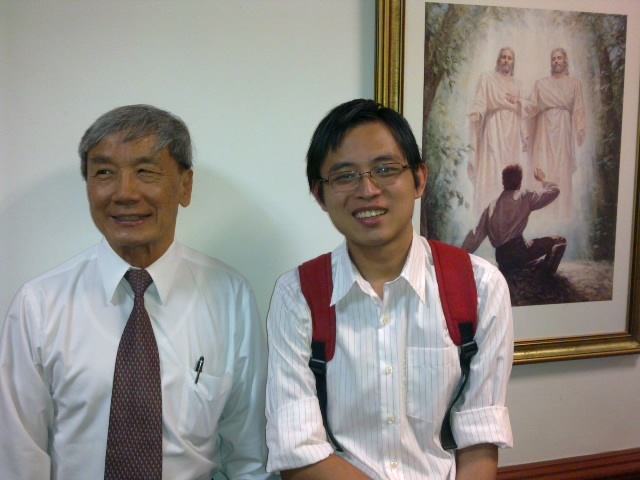 Among the missionaries is Elder Lee from Singapore too! Shuan loves to be a missionary too but needs to do his national service in Singapore first like all the other Singaporean men. He is the ward mission leader for Clementi and is doing his part to serve as a part time missionary. He has been called by me in our Singapore home as the President as the most senior of the family while I am away. He is a fine young man who is responsible, hard working and caring at home. He has qualified to have his own profile in our family website. We now need to help the two youngest boys Ern (17) and Ray (15) to earn theirs as they mature towards adulthood. 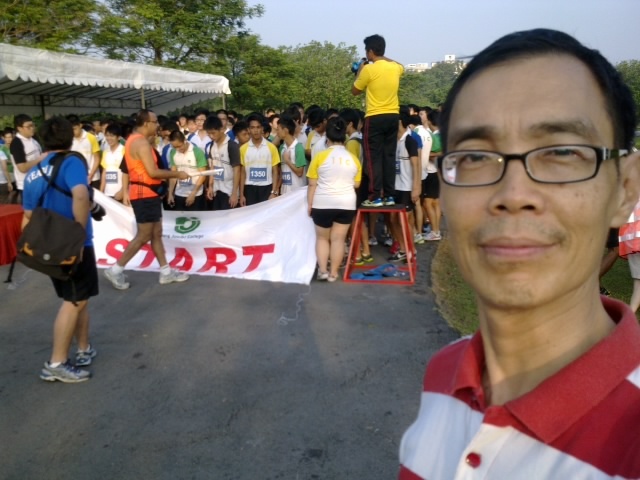 I was at the Chinese Gardens in Lakeside, Singapore on the day when Ern had his school 4km run to see him off at the starting line! In KL branch on Sunday, we had two visitors. The one on the left is of course the family's 'Uncle Tony' visiting from Orem, Utah in one of his regular trips to Malaysia since I knew him in the early 90s. 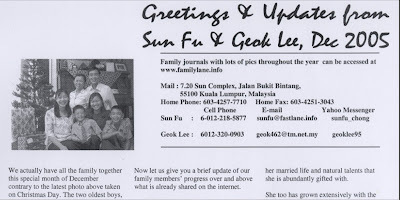 On the right is Lim Fung Cheer, son of one of the pioneer members in KL branch during the late 70s. 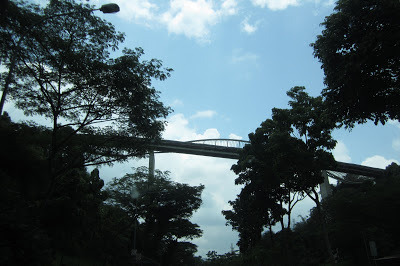 We spent time together hiking from the Alexandra Garden Trail to Mt Faber. Success climbing up to Mt Faber to enjoy the city view. An album of more photos are found here. I certainly enjoy the outdoors with physical activities to balance my intensive mind activities of my research, writing and consulting activities of my latter years. I am also glad for the spiritual activities of the Church that helps fill my mind with the spirit that keeps me close to our Heavenly Father. Back in KL, I will constantly be in search of new trails to run or bike . Here is one just behind our KL apartment to use to ride to the home of an old school mate of mine. He was an old friend of mine in school in primary 6 and parted when he left in secondary 1 and didn't meet again until 40 years later! I introduced him to a bike shop and so now he is a biker like me too. Right after he bought the bike, we went to meet another primary 6 friend from our class to have tea time together! We're all old boys of St John's institution in KL and have a webpage found here. We do have a candidate See more of our biking activities here. She comes as a pair of twins whose father was the 1st branch president of the Church in Kota Kinabalu and their mother the 1st Relief Society president. They just moved to PJ recently and came to know of them through the facebook page I had created for returned missionaries who have served in Malaysia. They were looking for missionaries who had taught their family and baptized them in KK in the late 90s and found my page in facebook. It was sad to find out that their mother had recently died of cancer and their father had passed away several years earlier. What a tragic situation I felt! I felt inspired to create a memorial post for their Mom found here. Their Mom had just passed away and they felt like going to Ipoh to meet the lady that was just next to her mother's bed that also died of cancer earlier. So I took them to Ipoh with a friend who also knew their Mom. The husband of the deceased friend, is the second on the left who guided us to the place of her ashes. While in the Woolley's food court in Ipoh Gardens where we met up with the Doreen Loke and husband, we ran into an old member named Christopher who used to be in KL. What a coincidental meet it was! I made a weekend trip to Kuantan bringing one of the twins with her friend along. After dinner with another couple from Kuantan, the comments made while we were having drinks was that my older brother and I looked so much alike! Is that true? ?